Hugo and his incredible camera monopod. 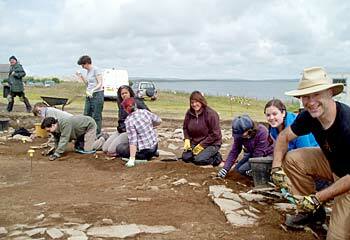 So, here we are at the beginning of week three on the Ness, with a new intake of diggers. Among them, we are delighted to welcome the eminent ceramics expert, Dr Ann MacSween. She is visiting for a week, to brush up her excavation skills, in the company of her daughter, Emily, and we only hope that the weather (yes, the weather again) is kind to them, and to us. 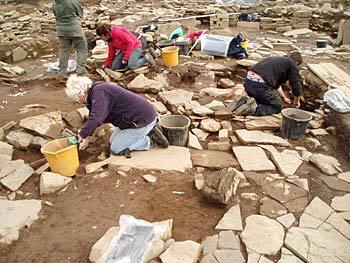 It was certainly nice enough yesterday and Dr MacSween, and her co-diggers, made swift progress in taking down the surface of the new extension to Structure Fourteen. They have been joined by Dr Hugo Anderson-Whymark, who supervised the structure last year and who has dragged himself away from the warmth of Australia to do the same this year. He has, to everyone’s delight, brought back his camera-on-a-pole. Looking like a slightly challenged fisherman, Hugo mounts a digital camera on the end of a very long, fibreglass pole, then manoeuvres around gingerly, while squinting upwards at the camera and triggering the shutter remotely. It looks an unlikely and difficult process, but Hugo has taken some amazing pictures in this manner and is clearly intent on many more. Later this week he will be joined by Adam Stanford of www.aerial-cam.co.uk with his even bigger pole – watch this space! Some of the new team. Hugo has been joined by another photographic wizard — Ken Stuart, from Cornell University. Diary readers from previous years will recall the interactive/immersive panoramic view, taken from the heights of a cherry-picker and digitally created by Ken. It was an astonishing and hugely popular idea and we hope that he will repeat in when the cherry-picker comes back towards the end of the dig this year. On a serious note, some intense thinking is being done about the site by site director Nick. Building on the brilliantly intricate and highly detailed stratigraphic work by the site supervisors, Nick has embarked on a re-examination of the site stratigraphy and phasing in general. He believes that the site formation processes were far more organic and fluid than understood previously. Instead of single, massive events, this implies piecemeal and discrete activities taking place, which, in turn, make the site more complicated to understand, but also even more of a fascinating challenge. More will appear on this theme as the dig continues. The central chamber of Structure Ten cleaned for photography. And more will also appear on the unusual wall line which appeared to the west of Structure One. More of it was revealed today and it may turn out to be the entrance into an area of re-use of an earlier structure. Watch this space. In Structure Seven, Colin is still grappling with the enigmatic flue-like structure, which is placed, more or less, in the middle of the site. The planning of it is now much clearer, but we are no nearer to discovering how it functioned. Elsewhere, and early in the morning, our on-site geologist, Martha Johnson, has been examining carefully each of the structures for evidence of unusual stone. In three structures she has identified chunks of light-coloured, fine-grained igneous rock, camptonite, exactly the same as the broken standing stone in the forecourt of Structure Ten. With luck, a piece of this rock will be thin-sectioned for positive identification and hopefully will be able to deduce which igneous dyke it came from. Not far away, a morass of burnt clay turned up. Not pottery as such, but in the middle of it nestled a tiny and beautiful thumb-pot, a most unlikely juxtaposition of material. Was a Neolithic child playing in a clay pit? In the central midden area, more pottery is turning up in discrete spreads, some of it very large pots indeed. There are also indications of sequential episodes of deposition instead of single dumping events. This ties in nicely with Nick’s rethinking of the formation of the site and tomorrow may well bring new evidence to inform that process. The new paving and potential entrance are investigated by Anne. 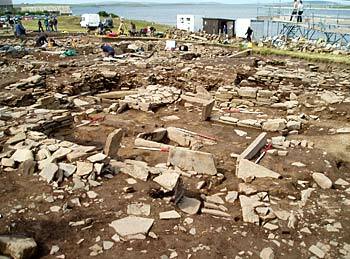 One of the most striking things about the Ness of Brodgar site is experiencing the sense of being in the centre of a natural, circular amphitheatre, created by the crescent moon shaped slopes that enclose the far shores of the Loch of Stenness and the Loch of Harray. There’s the feeling of being in the epicenter of a circle. 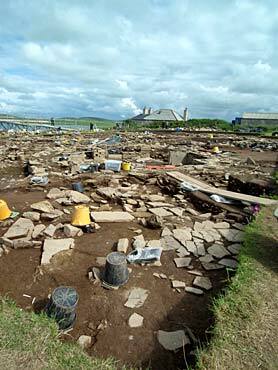 From the midden, where I’ve been digging, I can see the Stones of Stenness and the Ring of Brodgar. The perception of being centered is very peaceful. Of course, the silence, except for the soft sound of wind, the glorious cloud formations, with a cloud cap often clinging to the summit of Hoy, occasional drizzle (although mostly the weather has been sunny and mild) and a few fishermen in small dinghies all contribute to the pastoral scene. A pair of low-flying swans flew directly over the dig, calling to one another, as if commenting on the work going on below. It appears that everyone has found either small or moderate size pieces of pottery, so everyone I’ve talked with has experienced the excitement of finding an artefact. The site director, Nick, and Dan, Martin, and the director of the Willamette University (Salem, Oregon, USA) team, Scott, continually walk the site to illuminate what each worker is engaged with and in every encounter more of the site becomes defined, and understood through explanation. They are generous with their time and attentively address each question. The local World Heritage Site rangers (tour guides) are also on site, throughout the day, and when they’re not touring, they, too, add their knowledge of the site and engage in discussions about it. Looking across the site towards Lochview. Anne, who is in charge of the finds shed, is always pleased to receive the trays of finds, coming in, and her trailer is a good place to see and hear about the take of each day. With luck, you’ll be assigned to dig near Dylan Angell, who has a repertoire of songs, sung as well as you’ll hear anywhere, across genres. Broadway lost out when Dylan chose archaeology! The small shop on site, The Dig Shop, has a good selection of souvenirs, all made by Orcadians, and the proceeds go to the site. There’s a terrific warm cap, hand knit, offered in all the colors, topped with a choice of pom-pom or Mohawk hair-cut motif that has NoB in large letters, in the front. 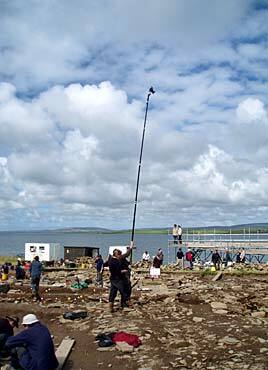 There’s a silver pendant of the Brodgar Stone engraved with the patterns that appear on the stone, and other pieces. Also, there’s a board game in which the players move around the archaeological sites on Orkney, lots of fun! It’s interesting to see the different ages of the participants. There was a group of school children being shown what to do and they were set to work and there is a goodly proportion of people who appear to be in their 60s and 70s, maybe 80s. Although most of the diggers are of the standard age at university, it’s very clear that everyone is welcome. At teatime, or lunchtime, one can sit with others or find a quiet spot to sit, amidst the buttercups, admiring Maeshowe, the entire landscape, waterscape, and skyscape. The tours for tourists are chock-a-block, each observer is entranced by what is before them. The enchantment does not wear off because even those on site, every day, are captivated by what is coming to light. Come and visit if you can.